A six-week training plan to build strength can reduce the risk of injury on a winter sports break, a top fitness coach says. According to a past US study, falls account for 75-85% of all ski injuries, mainly causing sprains, fractures, lacerations and dislocations. Of these, 30-40% affect the knee area, with women most likely to suffer this type of injury, the American College of Sports Medicine in Indianapolis reports. 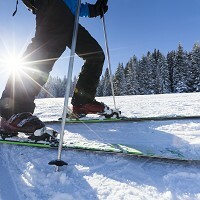 An unexpected mishap on the slopes can occur at any time, but a training regime alongside winter sports travel insurance can avoid a huge medical bill. James Phillips, a performance coach at London sports injury clinic Pure Sports Medicine, says that although some injuries are unavoidable, boosting strength and fitness is the best way to reduce the chances of getting hurt. He recommends following a structured six-week training programme before going away, addressing any areas of weakness. James advises people to mix up their training ahead of their holiday. It should include 30 minutes of aerobics three to five times a week, strength training three times a week, and flexibility and balance training to improve key areas such as quads, gluts and hamstrings. Once out on the slopes, skiers and snowboarders should take a sensible approach to how much they do, building up slowly. That gives the body time to adapt to the rigours of winter sports and will reduce the risks associated with exercising while fatigued. Holidaymakers shouldn't be afraid to have a lie-in or take a day off to give their muscles a well-earned rest if their body is telling them they need time to recuperate. James stresses the importance of ensuring everything is in good working order, whether it be ski boots or bindings. Check everything fits well (not too tight or loose) and does not to place excessive stress on the body, he says. A day on the slopes is taxing, and keeping the brain and body well hydrated will maintain both energy levels and mental alertness, which is especially important for those fond of apres-ski.